Since being a mum, I often find myself barely having anytime to get ready let alone put on makeup. I have definitely tried my share of products but when you are running a business and running after a 2 year old it is important to find items that last and don’t break the bank. Here are five of my favorite products. The first three I use on a daily basis and the last two I add when I am getting fancy :) They are all affordable, easy to use and actually keep up with my busy schedule. Maybeline’s Lash Discovery is my all time favorite mascara and I have definitely tried a lot! Since I have relatively long eyelashes (I know, I know, poor me) it becomes difficult to find mascara wands that reach into the inner and outer lashes and won't smear all over my eyelids. The lash discovery wand comes with a mini brush that is perfect for getting into the crevasses of the lashes and makes it easier to do several coats without getting the excess mascara all over my eye. 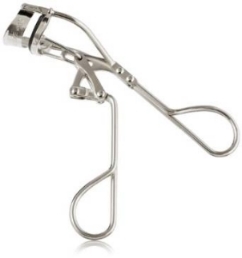 After trying a number of eyelash curlers I came across the Japaonesque Power Eyelash Curler and fell in love. The stylish design makes it easy to use and always puts enough pressure on the lashes to create a long dramatic look. My all time favorite feature about this curler is that when ordering this from the Japonesque website you receive a lifetime supply of silicone insersts. Another Maybeline product that I always stock up on is the clear Great Lash Mascara. This mascara does double duty for me as I use it for my lashes and eyebrows. It is great at keeping both my eyelashes and eyebrows in place. Since I hardly have time to even do my makeup trying cool looks such as a cat eye is almost always out of the question until I found Benefit’s “They’re Real Push Up Liner.” This brush is perfectly angled and has just the right amount of thickness to create the perfect cat eye. The noir eyeliner I recently received in one of my monthly birchbox package’s. Not only does this liner go on easily and smoothly but it didn’t smudge and stayed put until I took my makeup off at night. I actually needed a little bit of coconut oil to help remove it but I would rather spend a few more seconds removing it then the extra 20 minutes it takes for me to reapply it. So there you have it, just a few of my favorites! I would love to know if you have any eye must haves in your makeup bag, so feel free to share them here or e-mail me. Once in a lifetime there are a few products that come along that change your entire life! Okay maybe that is a bit much but these nail products have changed the way I completely do my manicures, meaning I actually do them now. When you are running after a toddler, while running a business you can't wait around for nail polish to dry. After a friend told me about "OPI's raipidry" I rushed out to buy it and now it is a staple in my beauty bag. Simply spray your nails, wait a few minutes and you have completely dry nails! I first found this nail file because I loved the look but turns out this glass nail file is as cool as it looks. Glass nail files last longer than regular files, they are better for your nails and never wear down. Even though they are suppose to last forever I bought like 20 of them in all of these really cute colors. A good top coat will do wonders for your nail color so you will want to try "Seche Vite's dry fast top coat." This top coal definitely keeps my nail color lasting for weeks, and adds just the right amount of shine. So if you follow us on Instagram you probably know I am a bit obsessed with essie's "luxeffects" in the color "rock all the top." This is perfect to add to almost any color and even works great by itself. I usually put a bit on each of my nails but it would great for a single nail, or to add an ombre effect. It's also great for disguising any mistakes. If I just have a solid color and it starts to not stay as perfect after a few days I just add a coat of this and Ta-da new nails! If there is anything you take from this blog, it would be this nail polish.